I think this basically gets things right. What we have today can’t properly be called AI at all. It’s just not advanced enough. But before long it will be, and once we hit that point—in around ten years by my guess— progress will accelerate quickly. 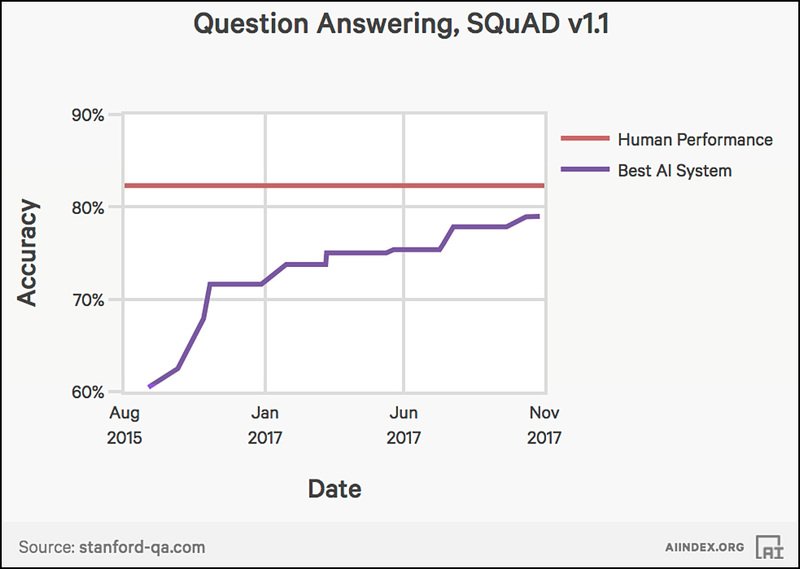 The best measures of AI aren’t numbers in a vacuum. They’re measures that compare the best software to the average human. In this case, both computers and humans are asked to read articles and then answer questions about the content of the articles. It’s still a bit artificial, but the general idea is to test general reading comprehension, surely a decent measure of what we commonly think of as “intelligence.” Computers are now only a finger’s breadth away from human performance. That’s pretty impressive, especially considering that a computer can come up with its average answer in a second or two, compared to several minutes for us meat types. 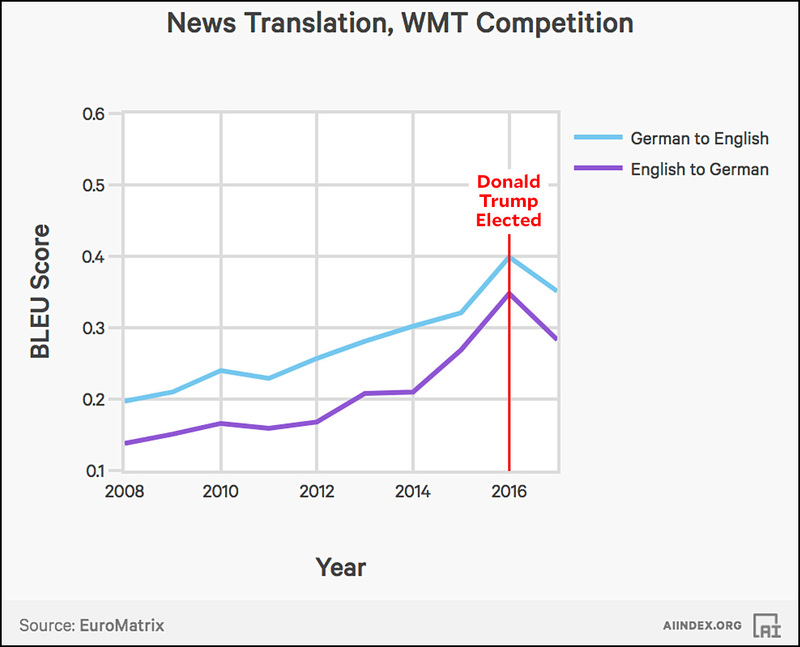 Language translation has made considerable strides in the past decade, and this chart puts a number to that. At the same time, it shows that machine translation has deteriorated in 2017. That’s hardly seems plausible.¹ As the authors admit, “It is unlikely that the performance of MT systems declined compared to 2016, but the evaluation scheme presented here is not perfect.” So take all these charts with a grain of salt. ¹Alternatively, this merely represents the Donald Trump effect. News articles in 2017 are stuffed with bizarre Trump quotes, and even the best machine translation software probably chokes when it tries to make sense of them. When it comes to bafflegab, humans are still the world champs.